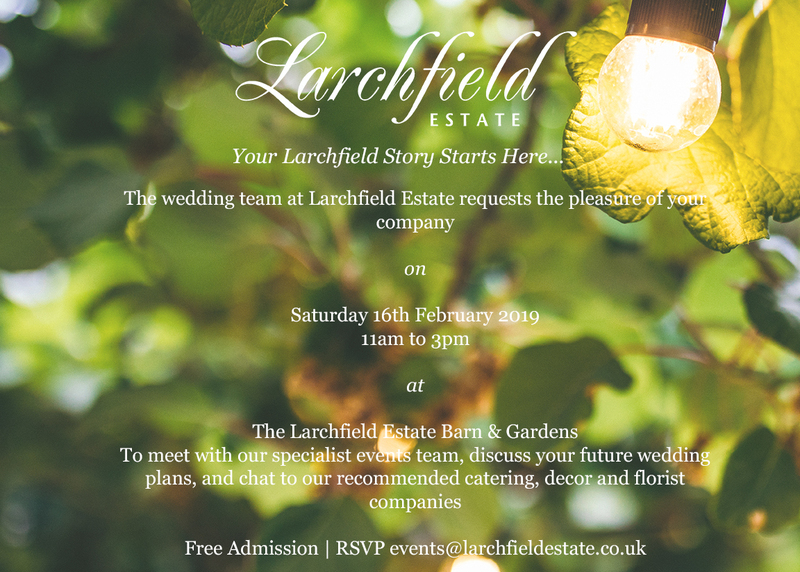 The wedding team at Larchfield Estate invites you to visit our exclusive countryside haven on Saturday 16th February 2019 from 11am to 3pm. Our Barn, Courtyards, Gardens and Cottages will be open for couples who are keen to explore the venue, providing the opportunity to meet our specialist team and recommended catering, décor and florist companies. We love to get to know our couples, so please do come along and say hello to Sara, Laura, Hannah, Cathy and Amelia, who will be able to answer any questions you may have about planning your big day! Take in the surroundings at Larchfield Estate… Wander around the gardens and lake area, picture yourself walking up the aisle at our indoor and outdoor ceremony locations, and enjoy the warm and cosy atmosphere of our traditional barn reception area. Our on-site accommodation will also be open, available for you to view the cottages where you can spend a restful night post-wedding, before sharing breakfast after waking up on your first morning together as a married couple! By entering your email address you consent to be contacted by Larchfield Estate for information on events and offers.